One of the most difficult parts of having a green thumb is controlling the things you don’t want growing in your garden. First, it’s just a sapling, and you’ll pull it up in the winter, and then suddenly you have a towering tree shading your home and your patio, and now you simply can’t remove it. After all, it’s a healthy tree, it really can’t be all that bad. As the tree has grown to be a legitimate portion of your backyard and become apart of the idea of your home in your mind’s eye, you’re going to have a hard time tempering those feelings when you find out that it’s actually an invasive species with berries that are causing the squirrel population to drop off. 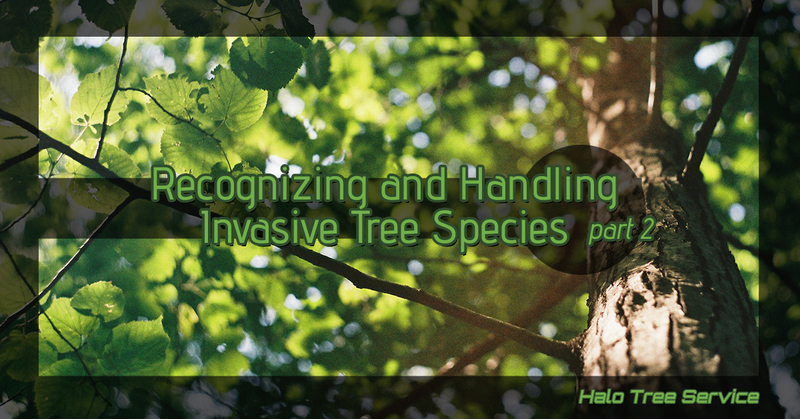 While most invasive species are a no-no, it can be hard to determine why you have to cut down this tree and that is as much a part of your backyard as the grass and that lawn furniture you inherited. How do you identify if your tree isn’t as innocent as it appears? Well, there are over 20 invasive species known to populate the Shelby Township. Recognizing a species that’ not supposed to be growing in your backyard is half the battle to making our ecosystem less diluted. If you allowed a Brazilian Pepper tree to grow and run wild in your backyard, we don’t blame you. They’re beautiful trees. They’re the kind of tree you want to sit beneath and watch the sunset through the canopy of thick, dense leaves. They’re the tree that makes the perfect silhouette on a moonlit night with candles flickering beneath. The canopy of leaves is dense, so it provides a very neat look beneath it as it will allow very little light to seep through. They can grow fairly tall and have the gnarled dark looking branches and trunk to make the tree look truly southern, yet totally sturdy. However, ants love them and enjoy carrying their seeds far and wide to help the tree spread with a tenacious energy. Due to its invasive nature, Florida has made the tree illegal to plant, despite its natural beauty. You may find some of the Florida holly berries available as garnishes and complements to a dish at a restaurant. They’re tasty, but due to the trees relation to poison ivy, it is known to cause irritation in some people. You can recognize it by its distinctive popcorn shaped seeds which have earned it the name “popcorn tree”. At first glance, it looks like any brand of desert eastern tree with a short body, straggling branches, and a rounded canopy. It is, however super invasive though it has many uses. The popcorn seeds it produces are used to make vegetable tallow and the species is often harvested for biodiesel, but all parts of it are poisonous and make your yard dangerous to critters as well as pets and unsuspecting children. If you are worried about a tree in your yard, contact us. We’d be happy to perform a tree service and inspect the integrity of the wood as well as identify the species and discuss your options with you. We want nothing more than to provide the beautiful area of Shelby Township to remain thick with tree foliage for years to come, so we’ll do right by your trees with tree trimming and potential stump removal. Reach out to us today.